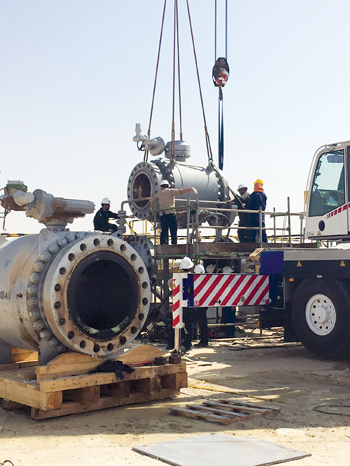 Stats Group was recently retained by a major operator in the Arabian Peninsula to provide pressurised isolation of a 36-inch trunkline in the first piggable isolation of its type completed in the region. The operator had identified a requirement to replace the pig trap launcher valve to maintain the integrity of the pipeline, thus ensuring routine cleaning and inspection operations could continue. STATS utilised its non-intrusive inline isolation tool which provided a verified double block and bleed isolation facilitating safe valve replacement and maintenance activities to be successfully carried out. The 29-kilometre pipeline had no valves or means of isolating the pipeline between the pig trap launcher valve to be replaced and the production manifold. The use of STATS Remote Tecno Plug allowed a short section of pipeline to be isolated and prevented a shutdown of the production facilities and the timely and costly process of de-oiling and flushing the entire pipeline. This approach also has a positive impact on the environment by preventing extensive flushing, cleaning and disposal of oil from the entire pipeline. Conventional isolations of this type would involve a traditional hot tap lip seal line-stop and vents to achieve an isolation whose sealing integrity is neither guaranteed to be leak-free, nor the line-stop provide a verified double block and bleed isolation. The Remote Tecno Plug system offers a verified, fully tested and monitored isolation while in the pipeline system, thereby avoiding additional tie-in weldments for the isolation tool or vent fittings. The Tecno Plug is fully certified by DNV GL to verify that the design criteria satisfies the requirements for Pipeline Isolation Plugs to provide dual seal and isolation in accordance with Offshore Standards; DNV-OS-F101 (Submarine Pipeline Systems) and recommended Practices; DNV-RP-F113 (Subsea Pipeline Repair) and in compliance with the following code; ASME BPVC Section VIII, Division 2. The client had the replacement pig trap valve in stock and required the Remote Tecno Plug delivered within a four-week window. The fast-track project included a site survey to verify the client pipeline data, ahead of engineering, risk assessments and a factory acceptance test prior to delivery to the site location. 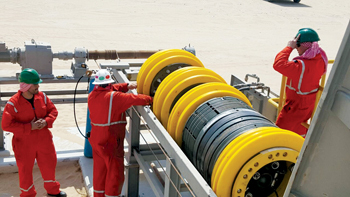 Once onsite, the Remote Tecno Plug was loaded into the launcher and pigged through the pig trap valve and positioned in a short section of pipeline between the valve and production tee, this provided the option for the client to restart production during the valve replacement activities. During pigging operations, the Remote Tecno Plug was tracked and accurately positioned using through-wall communication. An extremely low frequency (ELF) radio control system sets and monitors the Remote Tecno Plug throughout the isolation. The Remote Tecno Plug was then hydraulically set, providing fail-safe and fully tested double block isolation against 15 to 20 bar pipeline pressure and its toxic contents. As is typical in the region the pipeline has high H2S sour service (11 per cent) so it was vital to the safety of the worksite and personnel that the Remote Tecno Plug provided a safe and reliable barrier prior to breaking containment. Independent testing of each seal with full pipeline pressure confirmed leak-tight isolation and the pipeline was bled down to ambient from the pig trap launcher to the rear of the Tecno Plug. The annulus between the Tecno Plug seals was vented to ambient to create a zero-energy zone. The Remote Tecno Plug features a fail-safe design which uses differential pressure acting on the tool to energise the lock grips and seals, this is referred to as self-energisation. When the isolation plug is self-energised the isolation is maintained independent of the remote-control system, it is however backed up by the hydraulic control system which maintains the isolation when the differential pressure is below the self-energisation threshold. Once the Remote Tecno Plug is activated the hydraulic circuits are locked in by fail-safe solenoid valves. The lock grips provide twice the required lock contact area providing 100 per cent contingency. In the event that the hydraulic control system is compromised, the tool actuation mechanism will unset when differential pressure is equalised. This feature ensures pipeline integrity is maintained and the Remote Tecno Plug is always recoverable upon job completion. After the isolation stability hold period the ‘Isolation Certificate’ was issued and the Tecno Plug was confirmed as providing double block isolation allowing the valve maintenance to commence. The Tecno Plug was constantly monitored and remained stable for the full three days while the valve was replaced. During the pig trap valve replacement, the operator conducted additional maintenance including replacing the 12-inch kicker line valve and 4-inch drain valve. With maintenance work successfully completed, the Remote Tecno Plug was used as a test boundary to perform a reinstatement pressure test. This was achieved by raising the pipeline pressure from the pig trap launcher side while the Remote Tecno Plug remained in a fully ‘set’ condition. The reverse pressure test operation created a test boundary to confirm the newly installed valve. Finally, the plug was unset and reverse pigged back to the launcher for demobilisation.